I confess; I adore winter. I love the invigorating winter walks in the crisp, fresh air! 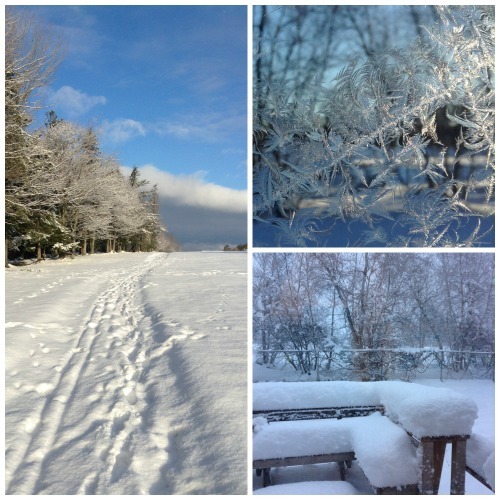 I love capturing (for Instagram) the beautiful landscapes of snow and ice and frost. I even love shovelling! I think I’m able to enjoy winter so much because I arm myself with warm clothes to keep me cozy, and footwear to keep me safe on icy terrain (ice boot studs) and in deep snow (snowshoes). How? It’s simple! You can diffuse a drop of your favourite essential oil with a Terra Cotta Pendant diffuser and wear it all day long! You can choose an uplifting essential oil to create a cozy oasis of aroma around you wherever you go! Which essential oils can have this effect on you? This may take a little research on your part because everyone has his or her own experience of essential oils. But I would say the essential oils that will benefit you will be, primarily, the ones you like and, generally, citrus blends, Peppermint, Rose, Cassia, Jasmine or Neroli, or any blend of essential oils that makes you smile when you inhale it. Don’t let winter bring you down! Find the essential oil that lifts your spirits and diffuse it with our whimsical Snowflake diffuser pendant. Or choose one of the other 84 designs. You can even use one of the Car Diffusers to support this effort! Every day or so, smear the surface a little bit to refresh the aroma diffusing from it, adding more of the same essential oil or a different one. Take control of the winter blues! Take control of how you feel by diffusing peaceful, uplifting essential oils into your personal breathing space with a Terra Cotta Pendant wherever you go!